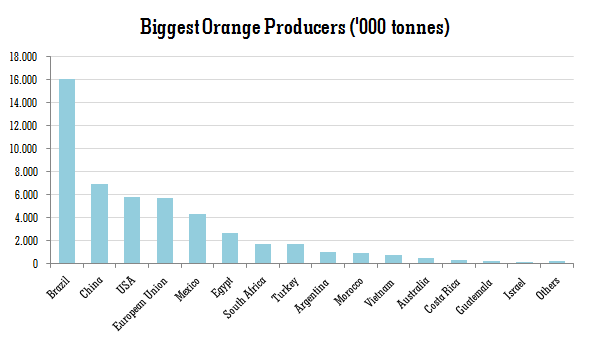 Brazil’s orange juice production and export figures are unparalleled: the country accounts for over 25% of orange production worldwide, 50% of orange juice production, and over 85% of world exports. Although oranges come from China originally, the fruit has found ideal conditions for growth in Brazil. Witness the fact that Brazil can grow oranges virtually all year round. 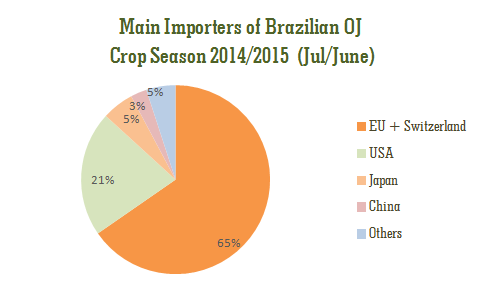 Brazil exports some 95% of its industrialized orange juice production. The industry provides a livelihood for more than 200,000 families in more than 200 cities and municipalities. Most of the juice exported is produced in plants in the State of São Paulo, using oranges grown in the citrus-growing belt that spans the State itself and an area known as the Minas Gerais Triangle, in the south of that state. The Brazilian citrus-growing belt has several research institutes that seek solutions to prevent and fight blights, boost yields, bring down costs and enhance the quality of the fruit. The industry—throughout all the links in the production chain—is a benchmark in terms of organization, technology and logistics, reflecting leadership built up over decades of investment and research. For the 2014-2015 harvest that ended in June 2015, the industry exported 1,138 tonnes of FCOJ equivalent*, with a revenue of approximately US$2.4 billion. The main destination was the European Union with 65% of exports, followed by the United States with 21%, Japan with 5%, and China with 2%, according to data from the Brazilian Ministry of Development, Industry and Commerce. *to facilitate analysis of the statistics, the industry usually converts non-concentrated juice into concentrated juice, so that all products share the same basis, and this enables comparison between different periods. 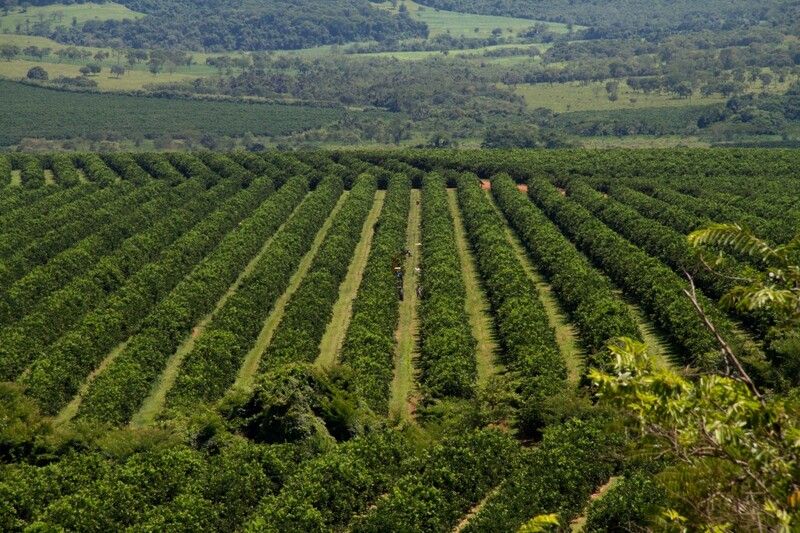 In May 2015, Fundecitrus (the Citrus Growing Protection Fund), an entity headquartered in Araraquara, published an inventory of trees in the São Paulo and Minas Gerais Triangle citrus-growing belt. The study—carried out by Fundecitrus—received the cooperation of Markestrat, FEA-USP Ribeirão Preto, and the Department of Exact Sciences of UNESP. One hundred and fifty-one professionals were directly involved in the project: following world-class best practices, multidisciplinary teams visited over 481 municipalities, traveling more than one million kilometers and using more than 150,000 square kilometers of high-resolution satellite images. The project carved the citrus belt into five sectors and twelve regions. Varieties of orange were split into four groups, and plants were classified by age group according to the year of planting. 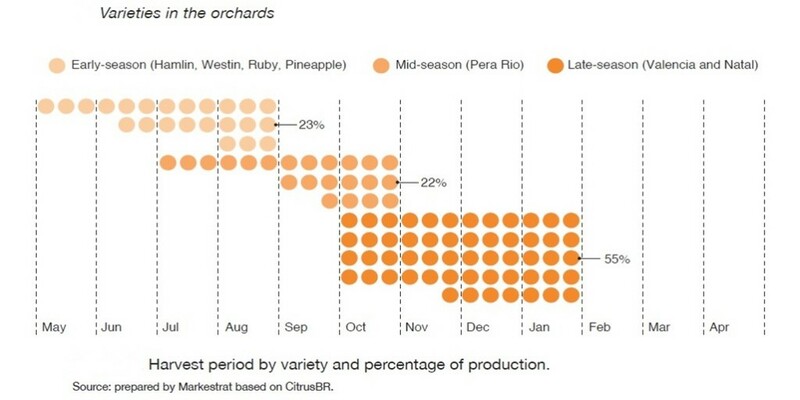 There are no official figures on the percentages of fruit from each type of supplier: this figure varies with each harvest, but the consensus is that the spot market accounts for only a small share of supply and that at least one third of the fruit comes from the industry’s own orchards. Orange growers are free to decide where they will sell their output: if they wish to supply the industry (and which company they wish to sell to), or to the fresh fruit market, or both. According to the PES project data, the vast majority of farms, in absolute terms, belong to small farmers. 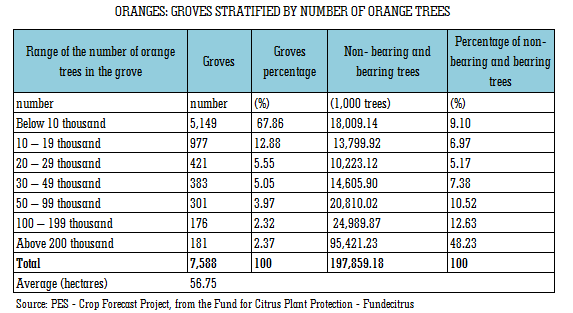 Farms with fewer than 100,000 trees make up 95% of the total number of citrus farms, and there are important differences between older and newer orchards: in the more recently planted ones the density of trees per hectare is 37% higher than the weighted average, and sweet oranges are mainly grown; in the older orchards it is mainly the Valencia orange that is grown. Data released in 2012 by MB Agro (the Consecitrus model) showed that in terms of productivity most of the growers (58.7%) were below 900 boxes per hectare, understood to be the desirable value for business sustainability. For some years Brazil’s orange and orange-juice industries have been discussing the setting-up of a Growers’ Council to represent orange farmers and the orange juice industry. The Consecitrus model has been under discussion for more than a decade, ever since Brazil’s sugar and ethanol industry established a council—Consecana—representing companies and producers, which took roughly two years to set up. The main idea was to create a council to represent growers and companies in order to discuss price benchmarks for the raw material and share risks and opportunities. It could also be a forum for the discussion of other issues affecting the sector. In 2010, CitrusBR staged a series of events in the main cities of the citrus belt, bringing together over one thousand citrus growers to discuss the Consecitrus model. The discussions were, at the time, supported by the Secretary for Agriculture of the State of São Paulo, João Almeida Sampaio. In February 2014, CADE, Brazil’s antitrust watchdog, officially approved the setting-up of Consecitrus, but some steps have to be completed and approved by CADE, which intends to follow the setting-up of the council and its first year of operations very closely. Currently the proposals of bylaws are being discussed.